^ CERES: State Historical Landmarks for Tulare County - NO.410 CHARTER OAK OR ELECTION TREE Archived 2013年1月4日, at the Wayback Machine. ^ a b Earthquake Facts Archived 2009年2月26日, at the Wayback Machine. ^ Aequoia Riverlands Archived 2011年10月9日, at the Wayback Machine. ^ Visalia Economic Development Corporation Archived 2013年5月30日, at the Wayback Machine. ^ Visalia-Top Employers Archived 2013年5月30日, at the Wayback Machine. ^ politicalsub.xls in PDF Archived 2012年10月17日, at the Wayback Machine. 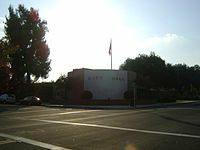 ^ "Post Office Location - VISALIA[リンク切れ]." United States Postal Service. Retrieved on October 29, 2009. ^ "Post Office Location - VISALIA Archived 2012年7月19日, at Archive.is." United States Postal Service. Retrieved on October 29, 2009. ^ "Post Office Location - VISALIA Archived 2012年7月18日, at Archive.is." United States Postal Service. Retrieved on October 29, 2009.